The UK’s National Environment Research Council (NERC) might have been pleased when looking at its Web analytics over the weekend to see a spike in traffic – until it realized that was a lot of internet jokers upvoting ‘Boaty McBoatface’ in its #NameOurShip campaign. What looked like an exercise in innovation and democracy in naming its new £200 million polar fleet vessel has quickly descended into predictable internet chaos, not least because the famous explorers that ships are usually named after aren’t exactly household names. 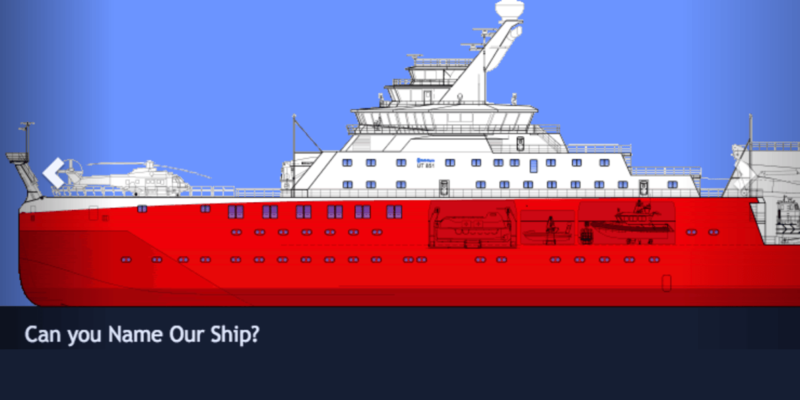 When we asked the British public, we were mainly expecting it to be marine research fans, thinking they would all be ex-Antarctic explorers or Arctic explorers because this ship, of course, will be going to the Antarctic and Arctic. Quick as a flash the prime one was Boaty McBoatface, which, when I looked this morning, with 24,000 [votes] and rising steeply. There was also Pingu, which of course would work in the South Atlantic but not North Atlantic, where penguins exist. Boatamus Prime, Usain Boat, What Iceberg, Titanic and so on. But that’s not how the internet works, Lord West, and the only thing the entry form asks for as confirmation of genuine humanness is an email address. He went on to alleviate any concerns that this might actually be a public decision. The public do not get the final say, fun that they can have with this. It’s going to be named by the National Environment Research Council. Which makes all this sound like a bit of a (presumably not without expense) waste of time, or, a rather-too-successful publicity stunt aimed at… making science cool? New polar fleet boat names are usually decided by a committee of naval experts who come up with rather more ‘appropriate’ suggestions, which are then sent to the Queen for approval. “We also had someone from the lower deck to check whether sailors would make fun of this name,” Lord West explained. Bizarrely, the suggestions are actually reviewed after submission, so someone at the NERC is clearly a bit of a joker themselves. Civilians just cannot be trusted, after all, and this process certainly proves that. The viral power of Boaty McBoatface is now getting beyond the hands of its initial suggester.